Logistical services company Seabourne has recently opened a new Freight site in Rotterdam. Seabourne is not just strong on land and in the air, but also in sea cargo. From this new Rotterdam site the company can further optimise its sea transport. No challenge is too big for Seabourne. That is why Go on, Set us a Challenge is our motto. Next to our customary courier services, Seabourne also offers specialist on-board courier service. After all, some shipments need a bit more attention. Recently a dedicated Seabourne courier ensured delivery of the world’s biggest freshwater pearl to the buyer in Japan. It was the kind of shipment that required that extra bit of attention. ‘The Sleeping Lion Pearl’, a natural ‘baroque’ shaped freshwater pearl weighing 118,65 grammes, was auctioned on 31 May 2018 by auction house Venduehuis in The Hague in the Netherlands. In order to take this precious pearl housed in its antique, specially made gilded bronze box to the buyer safely and correctly, the Seabourne courier got on the first available flight to Japan and ensured a faultless delivery to a satisfied customer. Because that is how Seabourne makes the difference: through its personal dedicated service! Customers always have a dedicated contact person who keeps them informed at all times, all the way from the Netherlands to Japan. Seabourne ensures comprehensive insurance from the time when the article is received up to the delivery, anywhere in the world! And while the Seabourne courier ensures faultless delivery, the customer can check the status of the shipment at any time. With the ‘Seabourne Pack-Track’ the customer has full ‘visibility’ of his purchase from the pickup of the shipment till delivery to his front door. Seabourne Group is a professional, full service, packaging and warehousing provider with a host of experience. 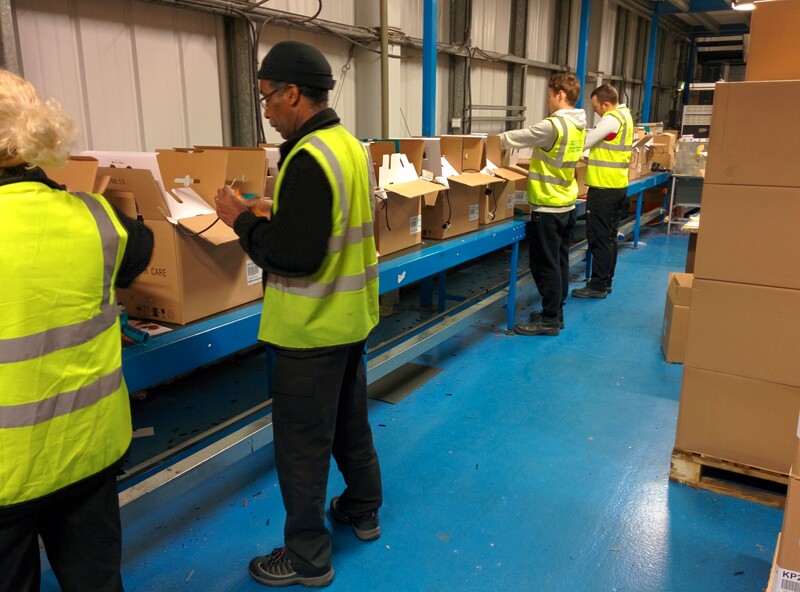 We warehouse and fulfil the students’ packs from Click2campus in Northampton, we discuss and plan with the client and will ensure that we deliver A to Z logistic solutions for the client’s needs. Whether it’s making and packing creative gift boxes or building and stocking impulse purchase display stands, our Seabourne Packing Service has the expertise and skills to get your job done within the agreed timeframe. Seabourne Group is able to be of service to its customers in all fields of logistics, from A to Z. The Seabourne Difference is our genuinely personal service and total flexibility, which allows us to leverage group-wide expertise and tailor our service to suit each individual customer requirement. This means we develop true partnerships that add value and build trust. You can enjoy a worry-free summer with Seabourne Group; we are at your service and ready to assist with all your logistical changes! Our friendly support team is available to help you 24 hours a day, 7 days a week. We are able to handle a wide array of logistical situations and will do our best to help you. On behalf of at the whole team we wish you a happy summer. One of the world´s biggest home electrical suppliers contacted us with an urgent need following the purchase of stock to fulfil a large order for one of the UK’s biggest retailers. The home electrical supplier needed to supply 17,000 units of a specific model of coffee maker in time for the retailer’s January sale, but had no available UK stock. Therefore, the home electrical supplier shipped excess European stock from Germany and France to one of Seabourne’s UK facilities in order that the units could be converted to be UK compliant. The units had European plugs on and the home electrical retailer contacted Seabourne originally on the basis we could change the plugs to a UK specification very cost effectively, as we have often done for this customer at this time of year previously. However, Seabourne were also able to assist in replacing other non UK items that came with the appliance. We helped coordinate the inbound shipments of stock, 4 way pallets (UK standard size), leaflets to be included with the coffee makers and starter packs of coffee also to be added to each unit. Total flexibility, complete commitment and a personal service. Seabourne sourced legally compliant UK plugs with the correct fuses within 48 hours as well as sourcing new barcoded labels compliant with UK legislation which were printed on-site to be applied to the units once they had had their plugs changed. Seabourne set up two production lines to utilise our skilled and qualified permanent staff effectively whilst using further temporary staff to fulfil less skilled roles. This enabled us to maximise the number of units processed each day. All of the stock was delivered to our Seabourne facility in Northampton within 3 days of the initial request where we had all the materials and arrangements in place to be ready to begin work immediately. Seabourne completed an average of 1,200 units every day, working extended shifts and weekends and arranging for multiple collections of the reprocessed stock every day in order to meet the tight deadlines set. Alongside changing the plugs we replaced the leaflets, relabelled the units, placed leaflets and starter packs inside and flash tested the units to ensure electrical safety. The stock was then palletised, wrapped and loaded for onward despatch. The customer was very happy with the quick turnaround and the quality of the work fulfilled, and they have since enjoyed working with us further on similar projects. Holland, your Gateway to Europe is happy to be able to offer you a discounted rate to attend IRCE! We’re able to offer a 10% discount* for our customers who register before June 7, 2014. Simply enter discount code 264HOL when registering to receive your discount! The Seabourne Group keeps you informed of the latest logistic news! December 6, 2013 / Dennis Henriks / Comments Off on The Seabourne Group keeps you informed of the latest logistic news! One year after our 50th anniversary with the new logos for our divisions, new website, redesigned transport fleet and new “social media” strategy we will share something new with you. As from today, we will keep you informed of the latest logistic news and trends with an extra channel. The traditional news page of the Seabourne page will keep in business and will be added with the new Seabourne Linkedin page. Discover our extra news channel which is designed on the Seabourne LinkedIn page. Follow our Seabourne LinkedIn page and save time to search for industry information. Read interesting blogs and industry related articles. If you’ve questions you can connect with people within the Group. Due to the new LinkedIn page we are able to serve you better and faster with sending all your shipments. If you don’t have a LinkedIn profile (yet) then watch our traditional Seabourne news page.